Temperament: Highly active, loyal, alert and trainable. Dobermans were developed in Germany by Karl Friedrich Louis Dobermann, with the purpose to protect him in his line of work (tax collector, watchman, and dog catcher). Many different mixed breed dogs and some purebred (for example. greyhound) were purported to be used in the inception of the breed, however the purpose was to combine aggressiveness, protective behavior, loyalty, trainability, and physical prowess. The National Dobermann Pinscher Club in Germany in 1899 and AKC accepted the breed in 1908. World war I and II caused genetic bottlenecks abroad in Germany and Europe. It seems the most predominant diseases in Dobermans at present are Dilated cardiomyopathy and cancer. However, breeders are also very concerned with Wobblers/CVI, autoimmune diseases and juvenile kidney disease. The Doberman breed has been found to overall have high levels of inbreeding with low levels of heterozygousity. Comparison of the IR values of dobermans with the village dog model finds that Dobermans have lost a considerable amount of diversity. This is evidence of one or more bottlenecks within the breed. 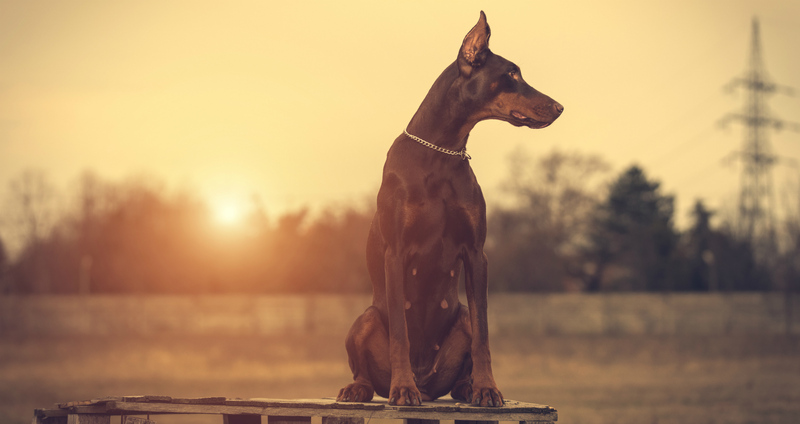 Analysis of the breed has found that the genetics within the American Dobermans' encompasses the genetics of the European and most of the Australian Dobermans; however it appears that Australia may have some different genetics evolving. Dobermans have average of 6.27 alleles at their STR loci, but only an effective allele average of 2.31. This indicates that while there is not much retained genetic diversity in the population, it is also not very well distributed. Due to the fact that Dobermans have low amount of average alleles as a breed and very low effective alleles, great care must be taken to preserve the diversity that still remains. This is achieved by breeding for higher than average breed OI (.2), lower than average breed AGR (-.06). Dobermans are also found to be highly inbred, so breed for much lower IR than breed average (.09), but ideally below 0. Lowering IR will help with recessive diseases (example PRA) or recessive component diseases. There are not many DLA types in the Doberman breed so take care to maintain those that exist. Pay attention and make an effort to create heterozygousity in the DLA types for healthier immune systems.